Lex Talionis! – A long term update on the Mahindra Thar! We’ve spent an adventurous four years with this mean and mod-friendly machine! So before we let you through to our original story on the Thar, here’s a quick look at the major modifications on our daily driver! Mahindra Customisation: Snorkel, Midnight Edition Front and Rear Bumpers: Inspire confidence while fording and enhance maneuverability / aesthetics. 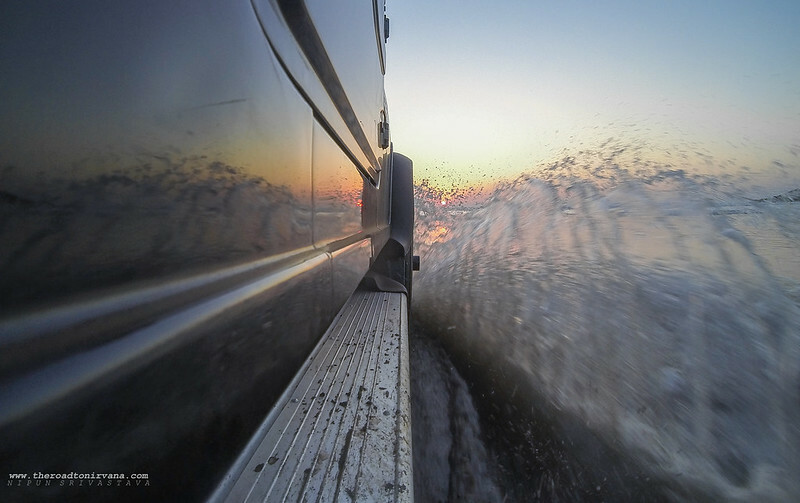 Bimbra 4×4: Heavy Duty Rock Sliders, Fiber reinforced Hard Top (V2), Aluminum Roof Rails: Protection from rocks underneath and the Hard Top takes cabin comfort and security to the next level. Hella: Front Auxiliary Halogen Lamps (Comet 500 Black Magic): Used as DRLs and driving aid. Onella: Rear Auxiliary LED Lamps: Rear driving aid and campsite illumination. Aurora LED: Front LED Bar (Off-Road): Off-road path-finding. Cooper Tires: Discoverer STT Pro 31″ Mud Terrain Tires on 15″ Steel Wheels: Improved off-road capability, increased stability on road, the trade off – an audible ‘humm’ while at speed, reduced top end. Mopar: Wrangler Hood Latches: Aesthetics primarily, eliminates squeaky noises made by stock metal bonnet Latches. DampMat: Thermo-Acoustic Insulation: Reduced cabin noise and heat by 50%. Improved life inside cabin (and air-con efficiency) immensely. ARMORO: Custom Spare Wheel Cover: Adds attitude and improves overall aesthetics, protects spare rubber from elements. Each modification/add-on mentioned above has been made after careful research and due scrutiny of each available option in the category. The custom accessories market in India is steadily growing and so are the options that are natively available for enthusiasts to use on their individual rigs. We at TheNirvanaTeam & theroadtonirvana.com have also grown with the industry as end-users and as creators who use these products to our advantage while on the job. 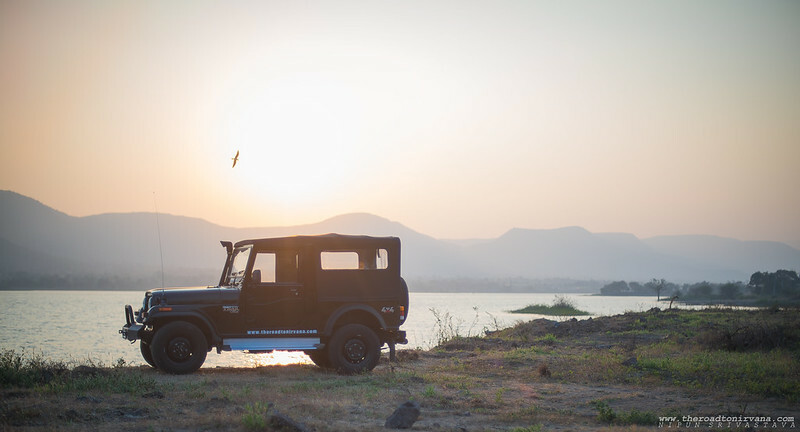 Now, back to our original story on the Mahindra Thar! Those who follow our work will know we did a quick review of the Mahindra Thar some time ago. 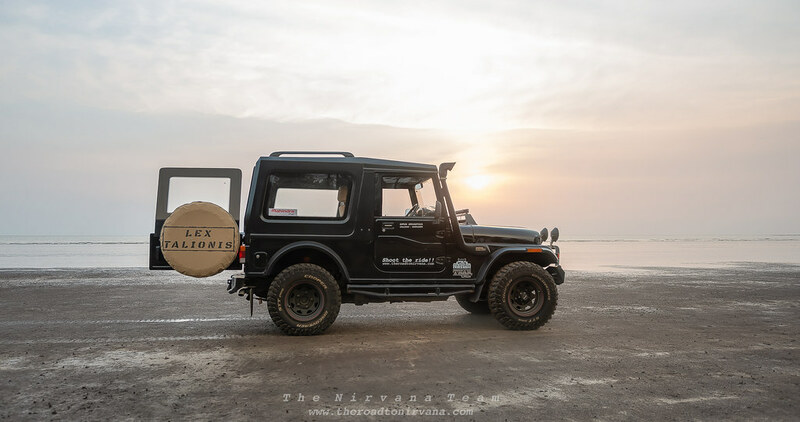 The Thar is an SUV which carries the tag of a Jeep in India. People who drive these brutes are often from a different school of thought altogether. These men and women, like most, value comfort, style, ease of handling and most of all practicality. With all these in the bag though, there is still something missing. The chase for this missing element is what makes people buy a Jeep. A jeep is not practical, it isn’t comfortable, the handling on these machines is appalling and as for styling – it hasn’t changed for the last 7 decades. So then, what is it? What makes one buy a Jeep? Nirvana set out to unravel this mystery in the best way there is! We cleared our schedule, packed up as much stuff as we could, stuffed it into a Mahindra Thar and then drove off in tandem with the rising Sun. For the first few kilometers, we battled the blistering cold as the Thar warmed up. The cabin heater takes its own time to wake up and the canvas-ish soft top roof was not helping things either. Eventually though we did find some semblance of temperature inside the cabin. The drive had now begun. We were now officially giving chase to the element, that one thing which makes one go out and buy a jeep. Barreling through the cold morning winds, we’d defog the windscreen manually (with a cloth) every few minutes. Irritating at first, it is something a Jeeper gets used to very quickly. Much like the bumpy ride one has to deal with even on smooth highway roads. The rear end of the Thar sits on an antique leaf spring suspension setup making it jump over every little lump of tar on the Indian road. Safe to say, the ride is not something to write home about. Even with the fully independent pot hole eating front suspension, there is only so much this Jeep can offer. Highway Crusin’ – Indside Story! The 2.5 Litre turbo-diesel does tend to impress when given the beans on the highway. Sluggish at first but given time, the Thar holds its own on the highway. 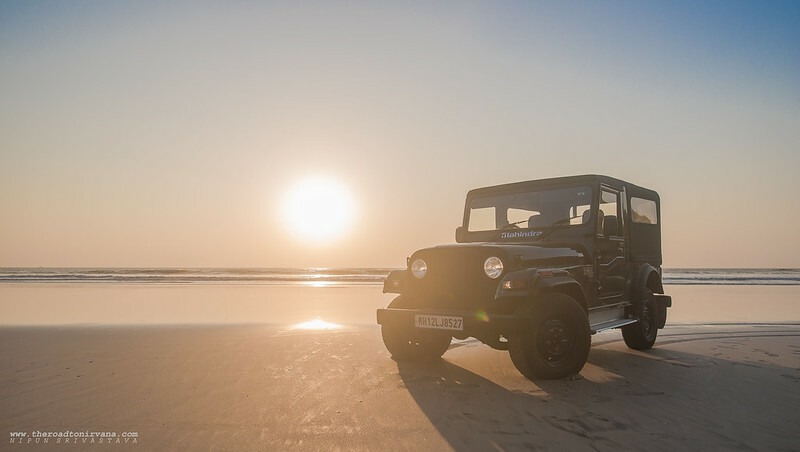 For what is essentially a box on wheels, the Mahindra Thar is a gem on smooth straight roads. On mountain roads however, curve after curve, one has to calibrate to the comfort zone of this Jeep. The driver learns to read the road for potential bumps and it’s his/her skill which decides how smooth or unnerving the ride will be. Barring a rudimentary seat-belt, there is nothing between the passenger/pedestrian and certain loss of limb. Oh, maybe the less than adequate brakes might soften the nudge a little. And then there is the price tag; eight and a half lakhs on the road (Pune). Phew! So where does all that money go? Clearly the interiors (or the lack of them) is not something which eats up the budget. As we found out, the Borg&Warner 4×4 transfer case mated to the 2.5 turbo is where the money’s at. It is the off-road capability of this Jeep that costs. 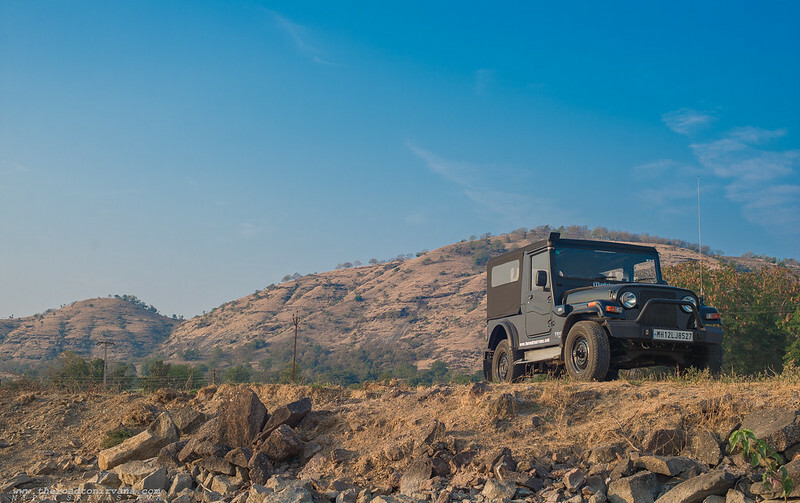 Off-road loyalists in India will probably want to discount the Thar’s ability when things get a little too technical (Compared to a traditional solid-axle). Not to say this jeep is bad when taken off the road. We found the stock Thar to be adequately endowed for someone looking to break into the world of Indian jeeping. Having said that, we were still miles away from discovering the magic element (and our destination!). We had driven a few hundred kilometers by now. Over highways and in the curves, we’d found our rhythm with the Thar; then something funny happened. As we got used to the Thar’s antics, she took on an almost endearing personality. Like a human being, even with all its limitations, the Thar kept moving. Eating miles and sipping diesel, she got us to our destination – Our holy grail – Hedvi. 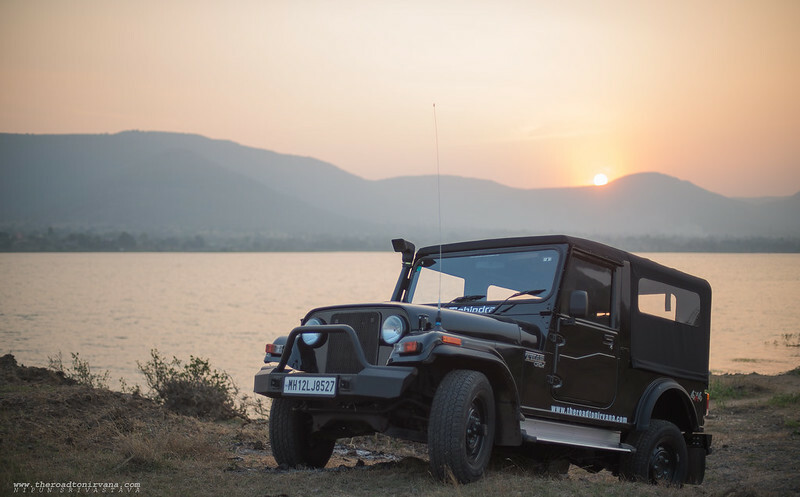 Despite all the niggles, we had fallen for the Mahindra Thar! Every time we looked, we couldn’t take our eyes off it! On a beach, out trailblazing in the wilderness or even on the city street, the Thar cuts a very crisp figure. And gosh is it attractive! Driving down the streets, everyone from young boys and girls to middle aged couples and even a few Army and Police personnel will give you the thumbs up. The Thar almost always becomes the conversation piece because truth is, the Jeep (as a concept) has seen it all. Over the past century, in all corners of the world and in every walk of life this vehicle in all its forms has proven its mettle beyond doubt. Starting from the military, through utility and going all the way till recreation, the Jeep can do everything. The compromise in comfort and luxury, we feel, is fair in return for the capabilities and downright uniqueness. Safety on the other hand is something Mahindra & Mahindra still need to work on for the Thar. Finally though we’d cracked it; we now knew why one buys a jeep. Read on. Romance is rare, charm is even rarer and class, well that’s almost extinct. There is a reason why a charming, secure and confident man makes any woman swoon. The reason is romance. Any man who is secure in himself and confident about his abilities probably knows how to woo a woman. He could walk onto her turf with his charm and the only thing a lady will do is welcome him. No matter how uncomfortable it is to be together, no matter how unpractical the love is and regardless of the cost, if the romance is alive – the love will flourish. And that is it ladies and gentlemen. 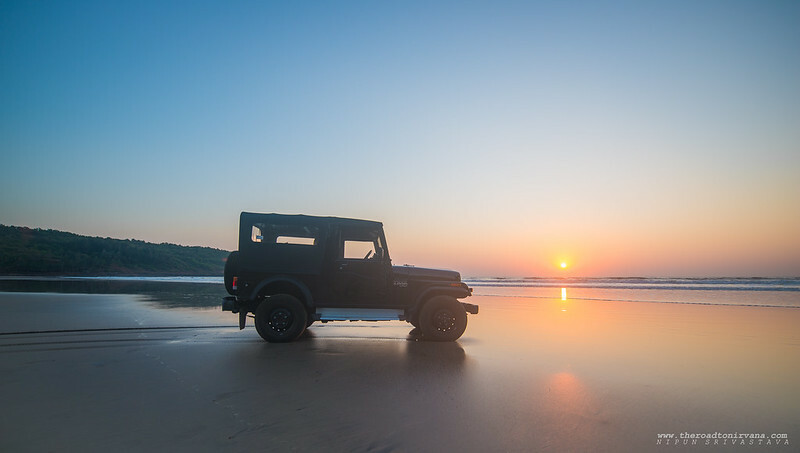 The romance of a lifestyle is what attracts enthusiasts to jeeps like bees to honey. It’s the romance of doing things differently, standing unaffected by the way the ‘herd’ looks at living and going where few bother to look which sets true blue Jeepers apart. Living with a Jeep is not for those corrupted by comfort! Comfort zones become a thing of the past with a jeep. A well kitted out vehicle and with a strong skill set on tap, anyone can become an explorer. In fact, we love the romance of Jeeping so much, we’ve bought one! 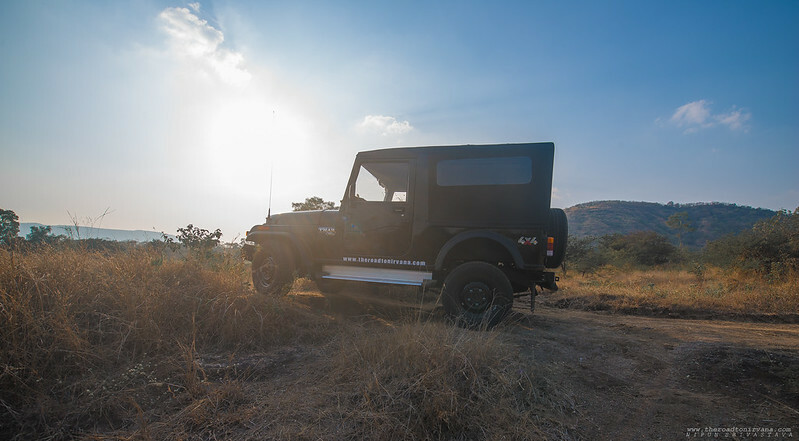 The vehicle you see in the pictures is a bone stock* Mahindra Thar from our very own Nirvana stable! Expect a lot more travel and Jeeping stories hereon out! Also, in our bid to encourage motoring conversations further, we’d like you to comment below and tell us what you think. We’d love to know how our readers satisfy their cravings for the road! Cheers! For more Jeeping photography click on The Jeep Life! This entry was posted on February 6, 2015 by Nipun Srivastava. 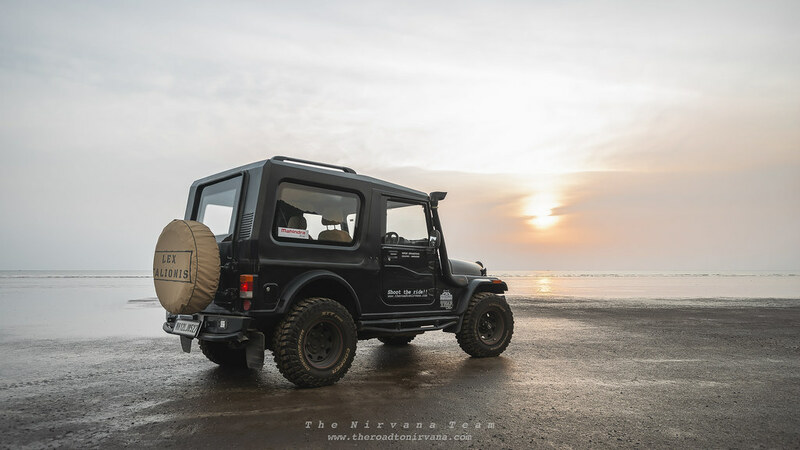 It was filed under Motoring, Photography and was tagged with car, city, drive, driving, hedvi, highway, jeep, mahindra, Mahindra Thar, mountains, Nipun Srivastava, photography, sand, sun, thar, The Jeep, Travel, traveller, vacation. Hey,liked your post n Pics, I was also bitten by the Thar bug in late 2013 you can call the Jeep Bug having just jumped into 50s i thought its a typically mid life crises , but the more i saw the pics,researched dwelled into forums the desire to own grew exponentially, finally the color was decided to be misty silver ,black being my all time favorite but since the Skoda we own is also black ,silver was next best liked by missus and me, its my daily drive now, we have to nurture the vehicle, understand it and it starts growing up on you , its like a pet dog you get home and the transition from puppy to your best buddy comes with all the the pleasure and pains, but finally you know you have a winner, its the instant quikfix for all the blues in life, we tend to find the difficult path to reach a destination filled with curves,uneven roads and offroads tendency ,the look on peoples face is worth every penny, and so is the pleasure of not bothering about the scratches and dirt on the Jeep. its got a personality which definitely rubs on the owner, and customization of Jeep is one thing which is what you do to your home to radiate your personality . finally i am an guy on road which i wanted to be. My wife and I have ordered the newly upgraded Thar ( the black looks menacing!) and waiting for it to arrive with a lot of excitement. In the meantime reading everything we can on it and came across this lovely article. The wife being in the late 50’s and me in the early 60’s, we are a little apprehensive about how the old bones will take what we feel will be a stiff ride – particularly on the pot hole ridden UP roads. We know it is going to be a challenging, but we have always wanted to have a proper “Jeep” and I guess the new Thar is probably going to be the closest we can get to one at this point of time. I am hunting for ways to soften the ride a bit and if any of you gentlemen out there have any ideas, we would be happy to hear them. Hey Ivan, thank you for your comment! The Thar has a stiff ride, no doubt about it. But that’s the vibe to go for in a Jeep. We bought our Thar back in Dec 14 and initially wanted to make a lot of changes to it. With time though, we’ve realized that keeping a jeep basic is the way to go. As far as softening the ride is concerned, there are aftermarket leaf-springs available to help the rear end jump a little less on bumps and over pot-holes. BUT! That is not our recommendation. We’ve chosen instead to run our vehicle in a semi-loaded state at all times i.e have some extra weight sitting behind (could be a person or something weighing about 50 kgs) and that helps make it bearable. The new Thar is largely the same vehicle as the old one barring a few welcome add-ons like the auto-diflock, defogger, new dash and corrected steering position. These add-ons will make your life that much easier as we’ve had to fabricate our own bottle holders and wireless systems dock. Like with all things Mahindra though, keep your expectations low and adaptability high. As then you’ll have a great time with your Jeep! Congratulations on your decision, sir. Here are some suggestions. 1. If you want a soft ride, an easy modification is to swap out the stock leaf springs for carbon fiber leaf springs. Known as CFLS they make the ride quality plush, but at the expense of body roll. You cannot drive enthusiastically once you have CFLS fitted. So, this is a dicey option for those who want stock handling. 2. You can get yourself Janniah helper springs, which are essentially leaf springs that make for a better ride. New Mars Enterprises of Hyderabad retails them. 3. The third option is to combine Janniah helper springs with Amada Extreme shock absorbers. This combination works very well. The Amada Extreme shock absorbers will keep the ride flat while the Janniah helper springs will soften the ride. In tandem, this combination should make for a sharp handling Jeep that also rides well. 4. If you have a larger budget, you can substitute Amada Extreme with Bilstein B6s or Tein dampers. I am in the same boat as you. I intend to buy the Thar in 3 months from now. I’m a motoring writer by vocation and have researched ways to make the Thar better than stock. These points have been compiled after experiencing the various suspension combinations on various modified Thars. Cheers. And I wish you happy ownership experience. Great photos and great jeep too. Thank you for your comment Jay! You’re absolutely right about the torque on the Thar, more than enough for the current dynamics :). And yes, the 2.5 is way better than the rumored 1.5, unless showing off is one’s only need. But like we said, the romance of a brand new jeep is just too exciting to pass up! So go for yours! What colour are you planning on picking up? Once upon a time, I had an Alberto green machismo 500. The closest colour to that would be the for rest beige. Black is my other option. Let’s see how it goes. In the meantime, eager to read about your exploits.